228 pages | 9 B/W Illus. The Spanish Camino de Santiago, a pilgrimage rooted in the Medieval period and increasingly active today, has attracted a growing amount of both scholarly and popular attention. With its multiple points of departure in Spain and other European countries, its simultaneously secular and religious nature, and its international and transhistorical population of pilgrims, this particular pilgrimage naturally invites a wide range of intellectual inquiry and scholarly perspectives. This volume fills a gap in current pilgrimage studies, focusing on contemporary representations of the Camino de Santiago. Complementing existing studies of the Camino’s medieval origins, it situates the Caminoas a modern experience and engages interdisciplinary perspectives to present a theoretical framework for exploring the most central issues that concern scholars of pilgrimage studies today. 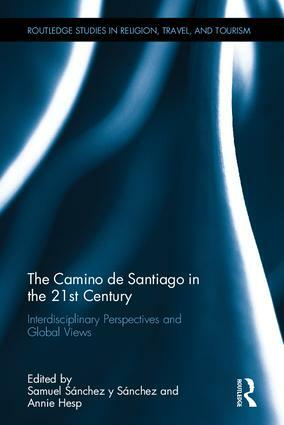 Contributors explore the contemporary meaning of the Camino through an interdisciplinary lens that reflects the increasing permeability between academic disciplines and fields, bringing together a wide range of theoretical and critical perspectives (cultural studies, literary studies, globalization studies, memory studies, ethnic studies, postcolonial studies, cultural geographies, photography, and material culture). Chapters touch on a variety of genres (blogs, film, graphic novels, historical novels, objects, and travel guides), and transnational perspectives (Australia, the Arab world, England, Spain, and the United States). Samuel Sánchez y Sánchez is Associate Professor of Hispanic Studies at Davidson College, USA. His research interests include literary and cultural representations of love and death in Medieval and Early Modern Iberia, Pilgrimage Studies, and Linguistics. He has published on the literary reception of Don Quijote, early modern desire, medieval narratives of mourning, and on the connections between early modern models of readership and material culture. Annie Hesp is an Instructor of Spanish in the Department of Foreign Languages and Literatures at Virginia Tech, USA. Her areas of research include literary and visual representations of the Camino de Santiago. She has published on the Camino as a pedagogical tool and on first-person Camino narratives. The public prominence of religion has increased globally in recent years, while places associated with religion, such as pilgrimage centers, and famous cathedrals, temples and shrines, have attracted growing numbers of visitors and media attention. Such developments are part of a global process where different forms of travel – physical movement such as labor and lifestyle migration, tourism of various forms, the cultural heritage industry and pilgrimage – have become a major feature of the modern world. These translocal and transnational processes involve flows of not just people but also material objects, ideas, information, images and capital. The public prominence of religion aligned to the modern growth of tourism (sometimes now claimed as the world’s single largest industry) has created a new dynamic relationship between religion, travel and tourism. It has been mirrored by expanding academic research in these areas over the last twenty years across a variety of disciplinary areas, ranging from anthropology, sociology, geography, history and religious studies to newly emergent areas such as tourism and migration studies. Such studies have also expanded exponentially in terms of the geographic spread of places, religions and regions being researched. thanatourism and pilgrimage to sites of suffering.